Tilera preps many-cored Gx chips for March launch • The Register – Carpet Bomberz Inc.
via Tilera preps many-cored Gx chips for March launch • The Register. Tilera is preparing to ship a 36 core Tile-Gx cpu in March. It’s going to be packaged with a re-compiled Linux distribution of CentOS on a development board (TILEencore). It will also have a number of re-compiled Unix utilities and packages included, so OEM shops can begin product development as soon as possible. I’m glad to see Tilera is still duking it out, battling for the design wins with manufacturers selling into the Data Center as it were. 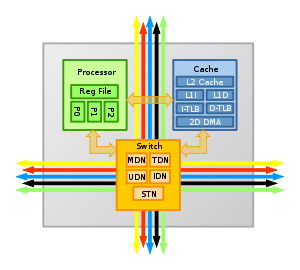 Larger Memory addressing will help make the Tilera chips more competitive with Commodity Intel Hardware data center shops who build their own hardware. Maybe we’ll see full 64bit memory extensions at some point as a follow on to the current 40bit address space extensions currently. The memory extensions are necessary to address more than the 32bit limit of 4GBytes, so an extra 8 bits goes a long, long way to competing against a fully 64bit address space. Also considering work being done at ARM for optimizing their chip designs for narrower design rules, Tilera should follow suit and attempt to shrink their chip architecture too. This would allow clock speeds to ease upward and keep the thermal design point consistent with previous generation Tile architecture chips, making Tile-Gx more competitive in the coming years. ARM announced 1 month ago they will be developing a 22nm sized cpu core for future licensing by ARM customers. As it is now Tilera uses an older fabrication design rule of around 40nm (which is still quite good given the expense required to shrink to lower design rules). And they have plans to eventually migrate to a narrower design rule. However ideally they would not stay farther behind that 1 generation from the top-end process lines of Intel (who is targeting 14nm production lines in the near future).